Planning your expensive cruise vacation by yourself is a risky business. You don’t know cruising industry, destination, customs. 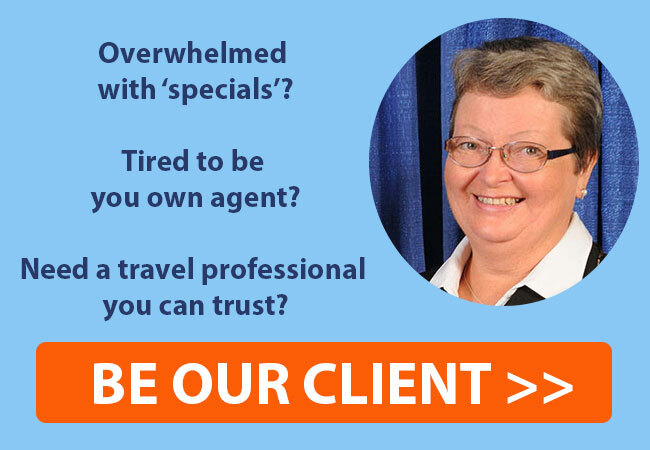 – Why don’t take advantage of knowledge and firsthand experience of Nadia Jastrjembskaia, CLIA-certified cruise advisor in the rank of Elite Cruise Counselor. We help our clients to plan a memorable trip but something unexpected happened. That is why we are the first people our clients contact. We are your personal travel advocate to help you get you on the next flight, if your flight is canceled or re-routed in case of an emergency. We assist our clients in resolving travel problems during their travel and after with claims to travel insurance companies. Do you know that traveler spends 42 hours on average to arrange a trip that includes cruise, flight, pre and –post hotel, transfers, and activities? Of course, most of time is spent to educate you about destination and travel products available on the market. The Internet is great to find information, though it can be confusing and non-reliable. But when it comes to booking complex travel arrangements it may be time-consuming and overwhelming. That is why we offer our clients to work in our partnership. We provide travel services that eliminate client’s hours surfing the Internet. Also, it may be economically beneficial for the client because we help our clients to find the best option within their budget. You can do your research if you prefer to and let us know about your findings. For cruise related vacations we don’t charge research fee, this is part of travel services. However, in some situations that require extensive researching we may ask you to commit nominal fee upfront that we will be happy to return as your onboard credit. We search through all of the options to find you the right cruise, shore excursions, restaurants, and activities. We provide our clients with information that allows them to make an informed decision. We change your travel arrangements before the final payment for a free of charge from our side as a part of our travel services. We help our clients to optimize their vacation time and budget by providing a few options to compare. It may be destinations, cruise lines, staterooms and suites, air carriers and routes, hotels, and activities on board and on land. We know our suppliers not from glossy brochures but from feedback received from our clients and our own experience. This makes our recommendations more valuable. Also, not all suppliers shine on the Internet. Most of them are the best kept secret in the cruise industry. Some of them even don’t invest heavily in marketing and operate on word-of-mouth recommendations. We make recommendations on destinations, cultural tours, sightseeing tours, and attractions. Working with us gives you an opportunity to expend your cruising repertoire and enjoy our travel services. We even can make recommendations for visa servicing companies. We have special prices for business class seats on some airlines that are not available to the general public. When booking your travel arrangements we will explain small print and cancellation penalties. Also, we make planning for special events as weddings at sea, honeymoon, anniversaries, and birthdays for free of charge. This is part of our travel services! Majority of cruise lines change prices on regular basis. Most cruisers don’t aware that they have a right to change price to new lowest one as many times as they want before the final payment. After the final payment some cruise lines allow you to receive free upgrade if available. Problem is monitoring prices. Cruise line or online agencies don’t inform you about price drops. We do. We offer price adjustment services for a free of charge without limitations. We will adjust price as many times as prices changes for all cruise line that have price changing policy in place. We automatically monitor prices for major cruise lines. In Aurora Cruises and Travel, we use concierge-style business model. We plan entire trip for our clients. Not just cruise, transportation and accommodation. But we also make dinner reservations; secure show tickets, arrange private fishing, snorkeling, and sightseeing – whatever you need. Being a travel concierge means handling a lot of details that traditional travel agents have steered away from. The concierge service means being available to assist clients while your cruise is in progress. Also, we can arrange concierge services through the hotel or travel insurance company at your final destination. The majority of our communications will be by e-mail and phone calls. Emails and confirmations provide you with printed record of your requests, the consultation, and arrangements we made for you. Also, you can call us 772 335-7017 if you have questions to discuss. If we provide the concierge service with all the bookings we made, you will receive a PDF with all confirmations. All contact names and pertaining information on sights to see, dinner arrangements, and transportation will be listed here. On request for an additional fee we can order an individualized planner with a full itinerary.